The Board of Directors of Kvarken Link have today decided to enter into a Letter of Intent with Rauma Marine Constructions Oy (RMC). The decision is based upon the result of a public procurement process initiated June 2nd 2018. – I would like to express my highest appreciation to all involved for the hard work performed, bringing the project to a success. The Board of Directors would also like to thank everybody in their different roles for the positive development of the future business relations between Ostrobothnia and Västerbotten. The ship is a modern ferry with 2 cargo decks with a total capacity of 1500 lanemeters and with drive-through arrangement, and a capacity of 800 passengers. 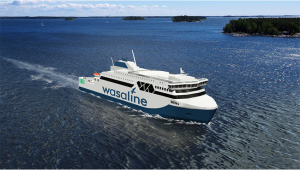 The propulsion system will be hybrid system with a combination of a dual fuel (LNG/Biogas and diesel/SCR) and batteries, connected to azimuth thrusters/pods and further details can be found in the RMC separate press release. Delivery will take place latest April 30th 2021.